I arrived in Sydney safe and sound! Said some teary goodbyes to the amazing people I've met in Melbourne on Thursday, and packed all my stuff up (a lot harder with all the stuff I managed to accumulate in 3 months...) Left the house early on Friday morning, said goodbye to the dogs and drove into the city for the last time. I was sad to leave that place, the people I met and the things I did will stay with me for life and I had such an amazing time, and the city is so beautiful. I got the train at half 8 from Southern Cross, and had a very boring 12 hour journey to Sydney! So I got up Saturday morning and we got the bus to Bondi beach which was so cool! 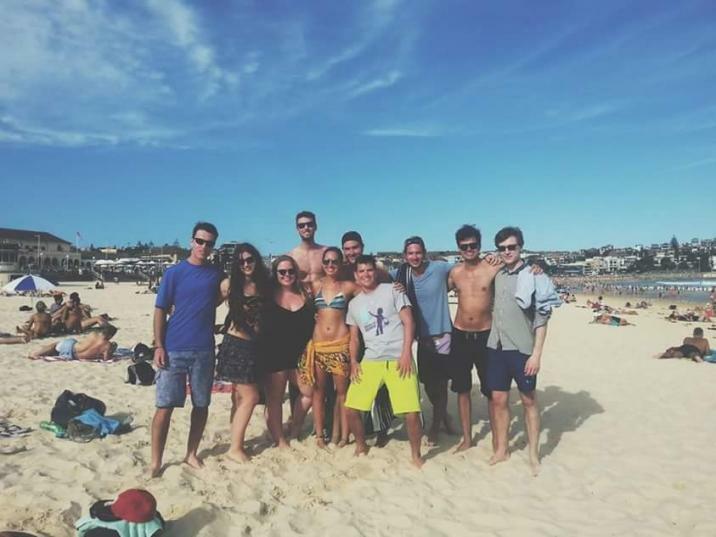 We hung out there pretty much all day, we went in the sea and lay on the beach and played beach volleyball and walked along the rocks on the coast, such a good first day in Sydney! Made a massive group of friends so easily, really made me feel better about leaving Melbourne. We got takeaway pizzas on the way back to the hostel and sat on the rooftop balcony and had a pizza party, then had a few drinks and sat around talking late into the night. Yesterday I got a massive lie-in and headed out about lunch time with a Dutch girl and a fellow British girl I met at the beach, and we got the ferry over to Manly beach. We got to see the opera house and the bridge which was so cool, made me realise I'm actually in Sydney and it's pretty amazing here. Lay on the beach and chatted all day, them headed back and had a lovely meal cooked for us by a German guy in the hostel, so nice to have a cooked meal! The kitchen facilities are so good here it's really nice to be able to make food. We just hung on the roof until about midnight the went to bed. Today is Australia day, and we're spending it eating chocolate and drinking tea in the lounge because the weather is top awful to go out. We might cook a meal and head out to see some fireworks later if it stops raining! I'm not missing Melbourne too much, because I'm having such an amazing time with these people! I'm excited to keep travelling and meet more fun people to hang out with. The hostel WiFi is expensive but pretty good, except for Skype! Not sure how long I'll stay here but that's all part of the excitement!